Since the release of the latest version of the WordPress Plugin Boilerplate, the top two things that people have requested are documentation complete with examples, and a generator to ease the pain of having to replace certain tokens throughout the boilerplate’s codebase. And I’m all for it – I’ve even committed to begin providing this material in early 2015 (and not just via the project’s website, but a few other channels, as well – more on that later). The awesome thing about open source is the contributions that can come from other people. Sometimes these come in the form of patches or pull requests, other times they come in the form of extensions, enhancements, and other types of projects that help improve the initial project. Over the past few months, a number of developers have shared their implementations of a generator. Eventually, all of these will be collected so that they can be pulled from the project’s web site. 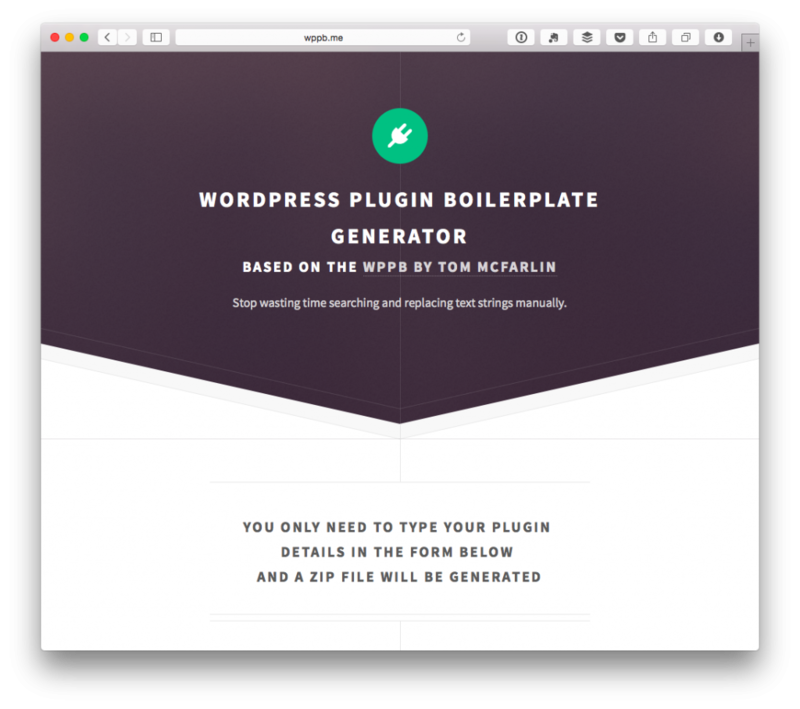 But this week, I received a heads up from Leland over at WP Chat that Enrique Chavez had put together a generator that may be of interest to those who are familiar with the WordPress Plugin Boilerplate. From there, the web app will pull the latest version of the source code from the Boilerplate’s master branch, replace the provided tokens throughout the code, and serve up a zip file with the plugin ready to go. Again, I plan to begin aggregating all of these resources at the beginning of 2015, but in the meantime, I’m happy to share some of the related projects that I find extremely useful, unique, and running along the same philosophy that’s wrapped up in WordPress. That’s really cool, looks great! Great, this really comes in handy! You’ll have to talk to Enrique about donations since the generator is his project :). this is excellent. I’m not a ‘real’ plugin developer by any stretch, but I have created numerous mu-plugins to keep things tidy and re-useable in relation to client projects. I enjoy that and want to learn more, so am really looking forward to a bit of documentation along the lines of “you’ve generated your plugin, so now what?”. This could just be the ‘leg up’ I’m looking for to get me more familiar with building a ‘proper’ plugin. Wow, this is really great work Tom! I’m just starting out in plugin development and this is a very handy structure to build from. Looking forward to more! Glad to hear it, Mario! Good luck :). Thanks for your great work!! Keep it up. This is great. I’ve tried both the plugin version as well as the wppb.me site. While I like the simplicity of both, the plugin version provides some additional stuff that may or may not be necessary and allows you to chose inclusion of a chosen ‘options” framework as well. Personally I love the idea of using an options framework to minimize deployment but many only integrate with the wp_options table and don’t provide a means to use a private table which could improve queries and allow for a much simpler clean up upon uninstallation. Is there any forecast to include a non-bloated options framework with the boiler plate on the horizon? Also, what about a primer for both the plugin bp w/ inclusion of the widget bp within? Is there any forecast to include a non-bloated options framework with the boiler plate on the horizon? Currently, there is not. I’d like the Boilerplate to stay framework agnostic because frameworks create an automatic dependency between the plugin and the framework that sits between it and WordPress. That’s fine if you want to go that route, but if you’re also looking at setting up custom tables and what not (like you mentioned), the the activation, deactivation, and uninstallation classes and files should suit your needs. Also, what about a primer for both the plugin bp w/ inclusion of the widget bp within? I have a separate Widget Boilerplate since it follows a different API. Well, although it seems like they really put the initial boilerplate together, it doesn’t install. Am I missing something here? Will a plugin generated by this generator install through the admin section of WordPress/plugin or do I have to FTP the files to the /wp-content/plugins/ and then activate through the admin interface? You’d need to S/FTP the files; however, you’ll need to look at the files that are extracted from the download. Not all of them belong on the server. The Boilerplate is meant to be used in development on your locale machine (rather than on your server / your remote machine) and you may need to setup some symbolic links or move directories around in order to get it to perform correctly. Very handy having the generator :) Makes the boilerplate even better to work with, thanks! I have made a plugin tool maker as well, but this has supported image size, custom post type or database, toolbox (metabox), admin bar (toolbar), shortcode and quicktags, plugin option, widget front-end/back-end, WP Ajax nopriv & auth, insert CSS, insert JS, Top level admin menu, tinymce plugin and other. Thanks for sharing! I’m happy to leave this in the comments for others to see. Note that I no longer maintain the boilerplate so you may want to reach out to Devin, as well! It looks like a well developed tool to get started with wp plugin development. I now need to figure out the components needed to make a real plugin based on a few ideas I have in mind. Next PostNext Yes or No To WordPress Frameworks?